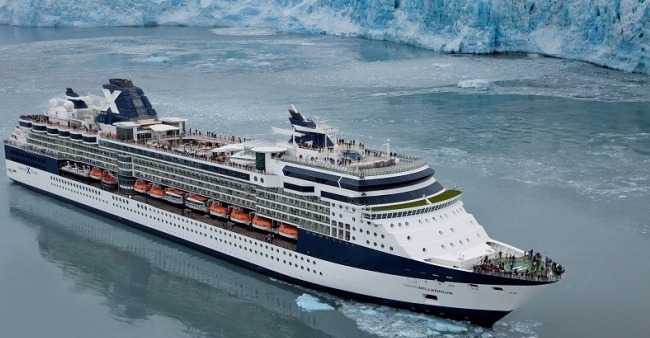 The exclusive Celebrity Equinox Cruise Ship is a ‘Solstice-Class’ Cruise Ship owned by Celebrity Cruises. Launched in 2009, the large ship can carry 2,850 passengers and 1,250 crew members. With an elegant, sophisticated interior and stylish, comfortable lounges and public areas, guests are guaranteed the ultimate cruise. Passengers on-board Celebrity Equinox have a wide choice of staterooms, all which come with en-suite bathrooms and bed linen of the highest quality. In addition to the luxurious Concierge Class Suites, the ship also offers a new deluxe Aqua Class suite. Based in Barcelona during the summer months, Celebrity Equinox offers cruises to The Mediterranean, then transfers to Fort Lauderdale for the winter season to sail The Caribbean. With a multiple of restaurants and cafes offering various international cuisines, guests can be assured of an unique dining experience, day and night. The main restaurant offers exquisite cuisine in elegant and intimate surroundings. A varied menu offers 29 selections with a different menu each day. For an alternative dining experience, passengers should try The Silk Harvest Restaurant which serves many Asian dishes from Vietnam, Thailand, Japan, India and China. Passengers will love sampling exotic new dishes in this stylish restaurant with stunning sea views. Day or night, Celebrity Equinox has numerous bars, lounges and clubs for passengers to relax and enjoy an exotic cocktail or chilled wine in stylish surroundings. One of the best lounges, is the amazing Sky Observation Lounge where guests can relax in the luxurious, plush leather chairs and enjoy the stunning, panoramic sea views. At night time, the lounge has regular live music and dancing, with theme party nights such as the Motown Soul Music night. Whether you want to relax by the pool or take part in some of the fun activities on offer, Celebrity Equinox has something to offer everyone. The unique patio on the lawn is great for outdoor picnics after a fun game of boules or croquet on the lush green lawn. For the more energetic, the fully equipped fitness centre with treadmills, exercise bikes, step machines and weights is open daily to burn up some energy! Kids will love the exciting fun factory on top deck with numerous activities and games to keep your children amused for hours. As the sun sets, the party on-board Celebrity Equinox begins, with numerous, shows, cabarets, musicals, magically acts, comedy shows and much more taking place throughout the ship. Various bars and lounges across the ship offer live music and dancing for a fun packed evening of entertainment. The deluxe casino allows passengers to try their luck with slot machines, black jack, poker and many more games, and a fully stocked bar that offers a wide range of spirits, beers and wines.